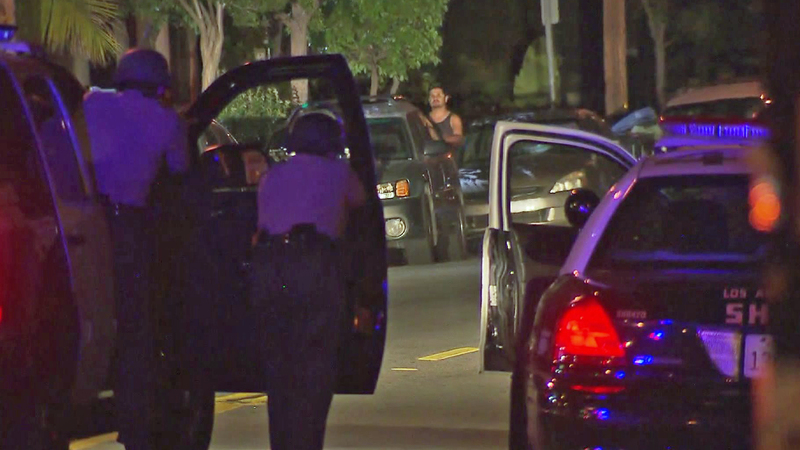 A 35-year-old gunman died Tuesday morning after a standoff and deputy-involved shooting in East Los Angeles, authorities said. Deputies responded about 2:46 a.m. to the 100 block of North Gage Avenue (map) after receiving a call reporting a gunshot victim, said Deputy Crystal Hernandez of the Los Angeles County Sheriff’s Department. The unidentified victim, a mother of two, was transported to a hospital in unknown condition, Hernandez said. News footage showed the woman’s children, a 1-year-old and a 4-year-old, being placed in a patrol car by deputies. The children were later taken into protective custody. Meanwhile, an armed man at the scene refused to comply with authorities, according to the Sheriff’s Department, and a standoff ensued. Sheriff’s deputies and SWAT officers established a perimeter in the area. News footage showed a man standing on a sidewalk outside a home, holding a handgun and a cellphone. At 4:15 a.m., the man shot at deputies, who then returned fire, the Sheriff’s Department said. Multiple rounds were fired in the exchange. The man was taken into custody and pronounced dead at the scene. No deputies were injured. A weapon was recovered at the scene, authorities said.